The former governor of Utah is due to make an announcement later today confirming his support for leading candidate Mitt Romney. 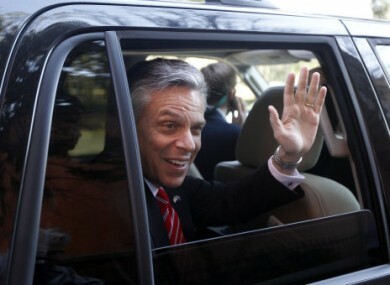 Jon Huntsman waves to supporters in South Carolina yesterday. REPUBLICAN PRESIDENTIAL candidate Jon Huntsman is expected to throw in the towel on his campaign today and instead lend his support to rival Mitt Romney. Officials on Huntsman’s campaign told the Associated Press he would be pulling out of the race today. Romney has emerged the victor of the first two Republican Party election tests in the campaign to win the party’s nomination – the Iowa caucus and the New Hampshire primary. The remaining Republican rivals are due to contest the South Carolina primary on Saturday. After a poor result in Iowa, Rick Perry’s campaign has been focusing on the South Carolina vote. His staff say he will contest the following primary (in Florida on 31 January) regardless of this weekend’s outcome, while Newt Gingrich said he would reassess his campaign if he does not win South Carolina. Email “Jon Huntsman to drop out of Republican Party's White House race”. Feedback on “Jon Huntsman to drop out of Republican Party's White House race”.